This week is going to be another fun one. 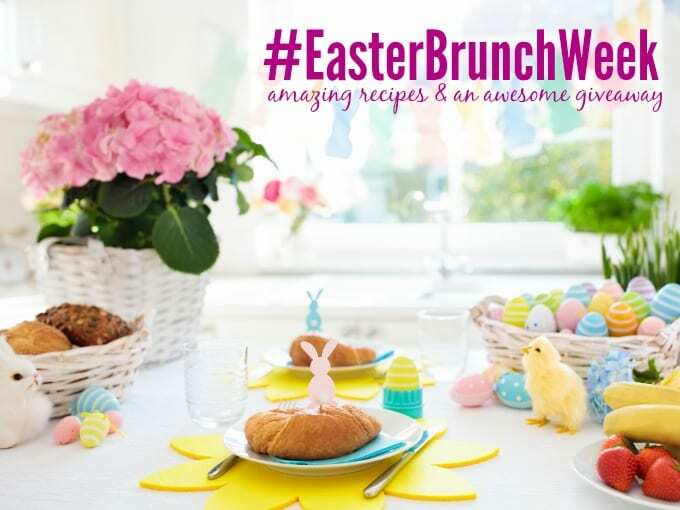 It's all about Easter brunch recipes. 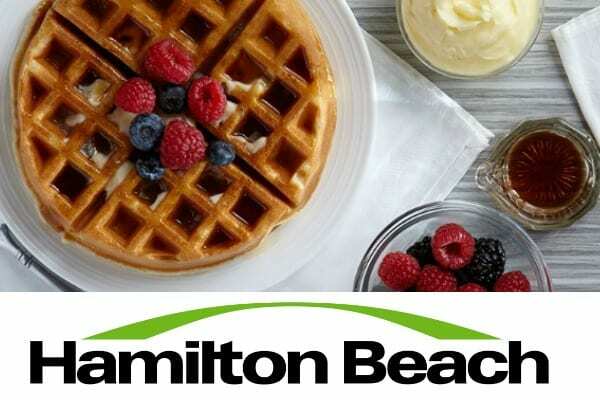 There will be plenty of delicious food and fun prizes to win too. 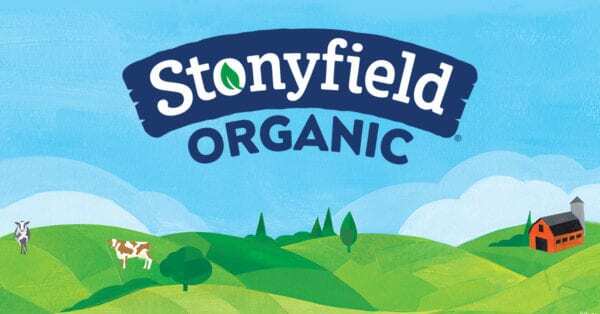 Be sure to check out all of the information down below the recipe card! First we have to talk about these rolls though. They are definitely a treat. 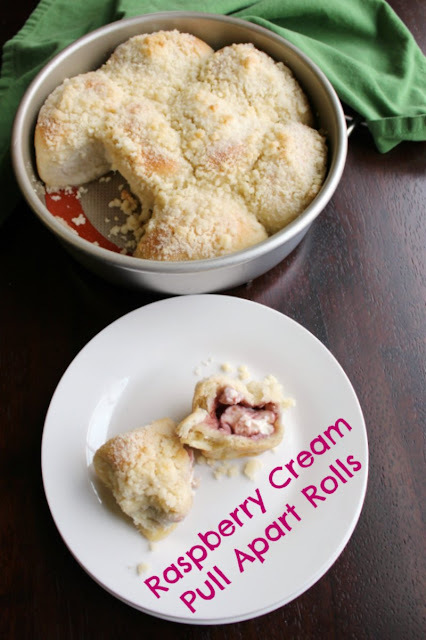 The soft bready exterior gives way to a burst of raspberry and warm cream cheese goodness. The golden streusel topping makes them extra special and delicious. It all comes together for an out of this world experience. The best part is, they are not difficult to make! 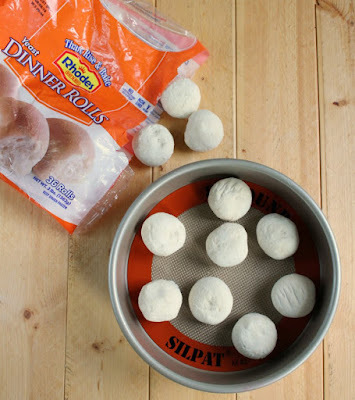 Starting with Rhodes frozen rolls makes them super easy. Just roll the defrosted dough out or spread it with your hands. 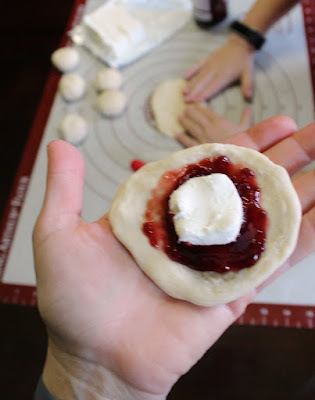 Add a small cube of cream cheese and a bit of raspberry preserves. Feel free to use your favorite preserves, I think strawberry or spiced peach preserves would be great as well. Wrap it all up into a nice little package and place it in an 8 inch cake pan. 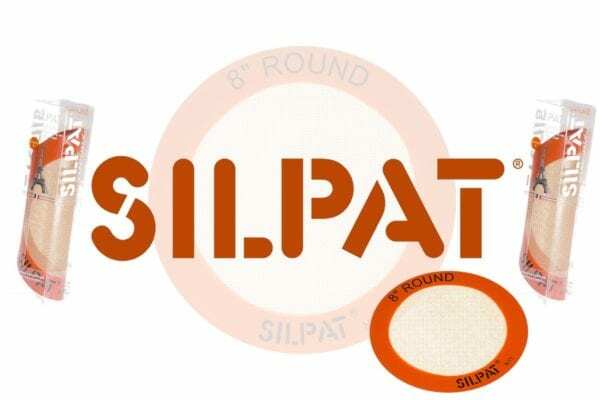 I lined mine with a handy Silpat silicone mat to make cleanup extra easy. 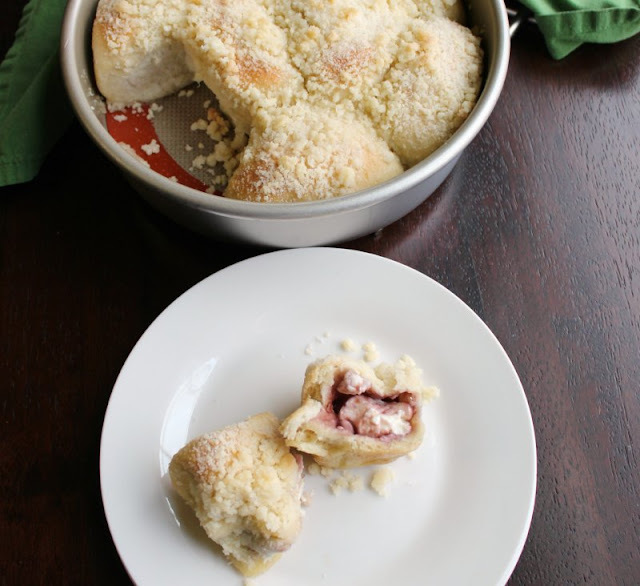 While the rolls proof, you can whip up a batch of streusel. Sprinkling that buttery goodness over everything takes them to the next level of goodness. 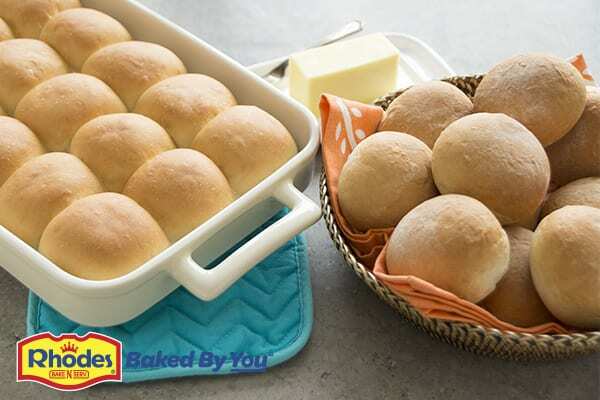 Luckily the rolls bake pretty quickly because by now you are going to be ready to dive in. I don't blame you, they're calling my name too. Little Dude and I both fell in love at first bite. My poor husband hardly had a chance to try them. He was gone when we made them and they were practically gone when he got home. Oh well, that gives us an excuse to make more. I think a couple batches with different kinds of jam would make an excellent addition to your holiday spread. The only issue is I'd have to try one of each! You could easily assemble the rolls the night before. Just cover them with some saran wrap sprayed with cooking spray and refrigerate them overnight. In the morning take them out and allow them to finish rising and come to temperature. Then bake them when you are ready. Easy peasy! Make sure you get the rolls sealed well. Pinch the dough together tightly to avoid leakage. 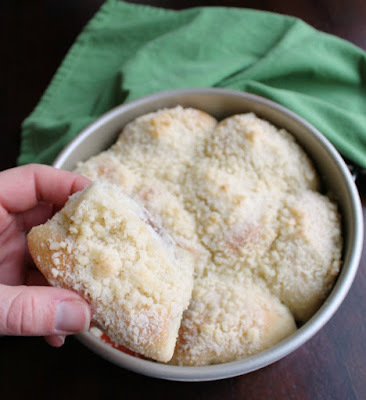 You can sprinkle the streusel on before or after you let the rolls rise. Feel free to assemble the rolls the night before. 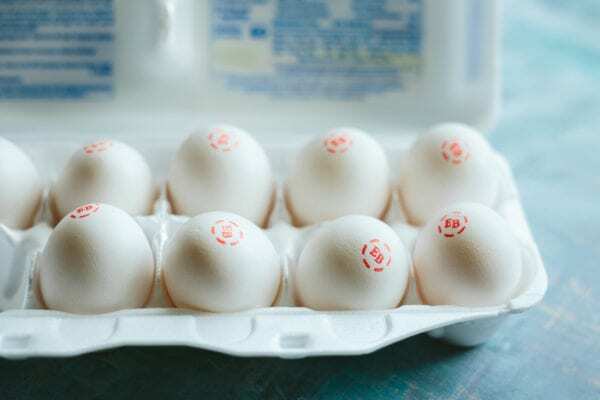 Cover them with sprayed plastic wrap and refrigerate overnight. Set on the counter for about an hour before baking. Use whatever kind of jam or preserves you like and let me know your favorite combination! 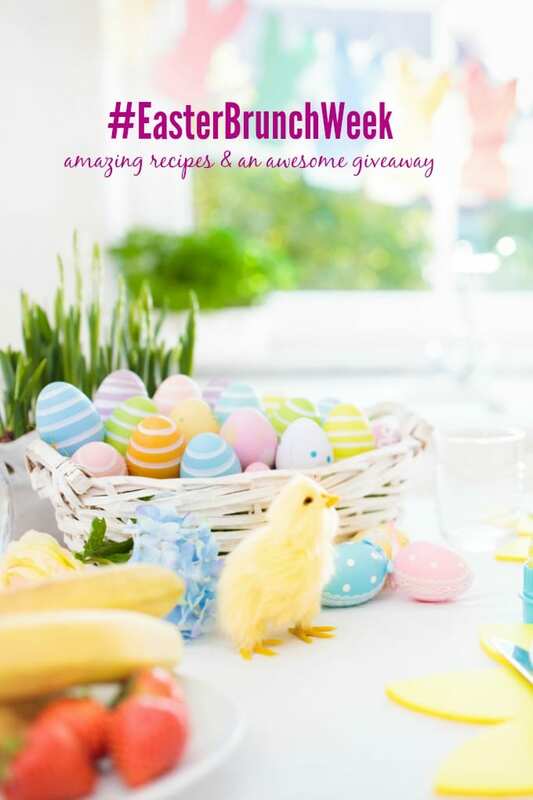 Be sure to follow along for all of the fun this week and don't forget to scroll down and enter the giveaway! What are you planning to serve Easter morning? Thaw rolls completely and place a silicone mat in an 8" cake pan. Roll each roll to about a 4" circle, it doesn't have to be perfect. Cut cream cheese into 8 equal cubes. 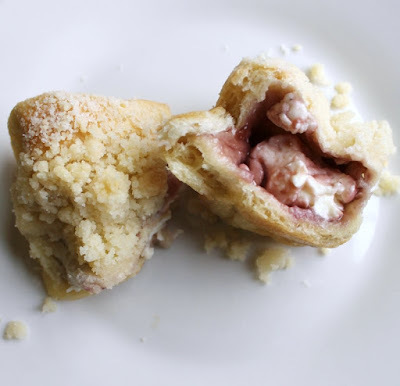 Place a teaspoon of preserves and 1 cube of cream cheese in each roll. Fold dough around the filling, being sure to pinch it together to keep the filling inside. Place seam side down in lined pan. Once all of the rolls are filled, brush with 1 Tablespoon of melted butter. Cover the pan with plastic wrap and allow to rise for 1 hour. 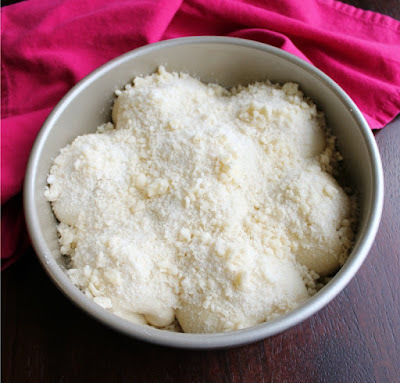 Meanwhile, in a small bowl combine 2 Tablespoons butter, flour and sugar. Use your fingers to work the mixture into small crumbles. Sprinkle over proved rolls. Hezzi D's Books and Cooks, Jonesin' for a Taste, Bloghetti, Walking on Sunshine Recipes, Who Needs a Cape?, An Affair from the Heart, Doodlecraft, The Mandatory Mooch, For the Love of Food, Frugal & Fit, The Foodie Affair, The Baking Fairy, and Cookie Dough and Oven Mitt. When my kids were still home,we didn't do a traditional dinner. Each person chose a favorite. We had some pretty hodgepodge meals. Grilled out steak, crab legs, asparigus with hollondaise, and mashed potatoes with gravy, as an example. I usually make something new to take to our Easter dinner. Not sure yet what it will be this year. I need to make these rolls this weekend. I even have all the ingredients on hand! I can't wait to try these amazing rolls, yum! Hope you have a very special holiday and thanks so much for sharing with us at Full Plate Thursday.